U.S. farmers are anxious for details on the trade assistance package the administration announced in July. Press reports indicate that program guidelines could be issued by August 24th. 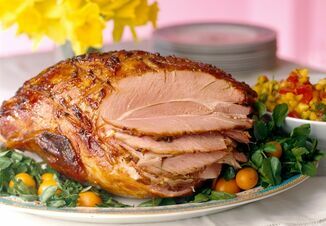 Meanwhile, business news articles and USDA data continue to shed light on agricultural export variables as the ongoing trade dispute with China continues. Wall Street Journal writers Kristina Peterson and Heather Haddon reported this week that, “Farmers fretting over a trade conflict sparked by President Trump’s tariffs may soon get more details on the $12 billion worth of aid that the administration has pledged, as their concerns mount over potentially plunging incomes and market losses. An Agriculture Department representative this week told The Wall Street Journal that the agency expects to announce official guidelines for the programs by Aug. 24 and be ready to implement them by Sept. 4. Farmers would receive payments between September and the end of their harvest, and would be required to provide documentation of what they grew, the agency said. The Journal article explained that, “The uncertainty has made it difficult for analysts to project farm incomes for the year and how the economic picture will play out. While some countries are retaliating against our farm economy because they don’t want to change their unfair trade practices, our administration will not back down – and we will stand with American farmers 100 percent! “Northwest Missouri farmers who will harvest smaller crops this year because of severe drought conditions are not happy that their payments will be smaller than those to farmers who harvest bumper yields this year. A second important challenge is deciding just how big the checks should be. The principle seems simple: pay people an amount tied to how much the new trade restrictions have reduced commodity prices. 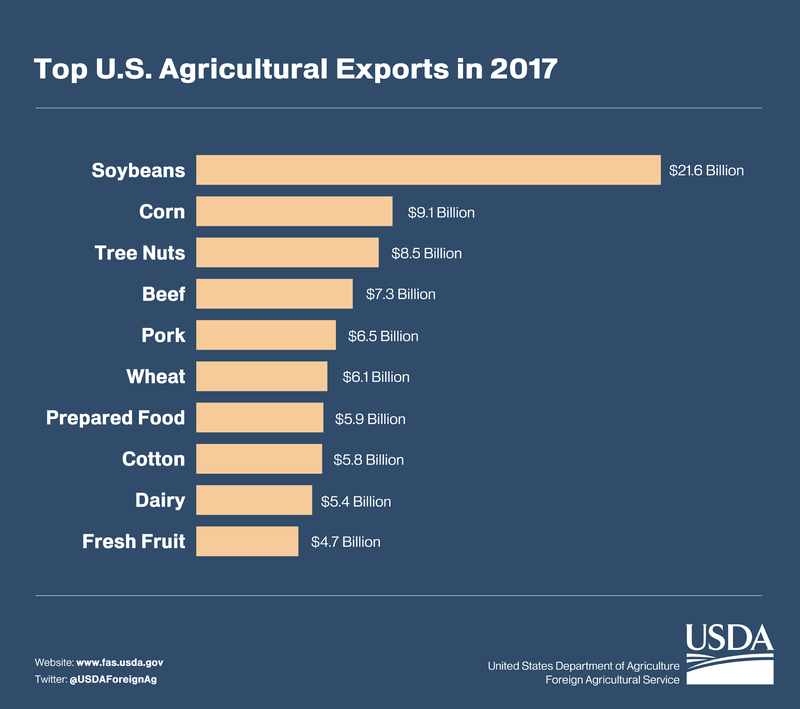 USDA- Foreign Agricultural Service (March 23, 2018). “[Rep. Adrian Smith (R., Neb.)] said it is the top issue farmers in Nebraska’s Third Congressional District are concerned about. He said the checks are intended to fill a gap. 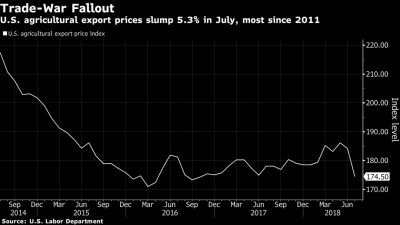 Bloomberg writer Jeff Kearns reported Tuesday that, “Prices for U.S. farm exports dropped in July by the most in more than six years as a trade war with China heated up, Labor Department figures showed Tuesday. “U.S. 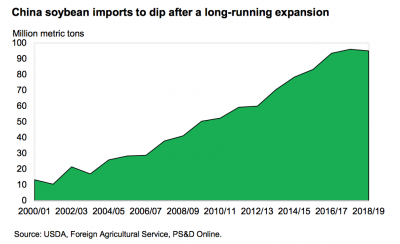 Farm-Export Prices Drop Most Since 2011,” by Jeff Kearns. Bloomberg News (August 14, 2018). Also Tuesday, Reuters writer Marcelo Teixeira reported that, “Shifting trade flows are redefining the Brazilian landscape, spurring more farmers to align their crops with Chinese appetites. The nation’s soy plantings have expanded by 2 million hectares in two years – an area the size of New Jersey – while land used for cane shrank by nearly 400,000 hectares, according to government data. “China’s growing demand for meat has supercharged soy imports for animal feed. 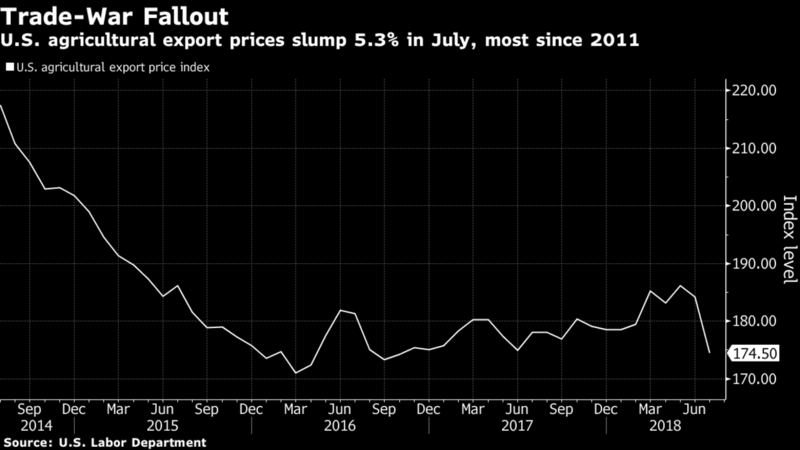 The Asian nation paid $20.3 billion last year for 53.8 million tonnes of soybeans from Brazil, nearly half its output — and up from 22.8 million tonnes in 2012. The article added, “Brazilian soybean exports to China rose to nearly 36 million tonnes in the first half of 2018, up 6 percent from a year ago. In July, they surged 46 percent from the same month a year earlier to 10.2 million tonnes. Nonetheless, this month’s Oil Crops Outlook from USDA’s Economic Research Service (ERS) noted that, “The U.S. [soybean] export forecast for 2017/18 was also raised this month by 25 million bushels to 2.11 billion. 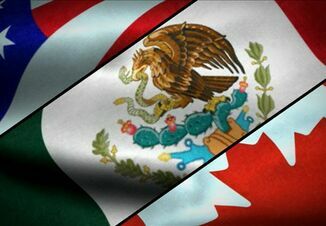 July export inspections of soybeans—at 118 million bushels—shattered a former high for the month. “Achievement of this milestone occurred despite negligible soybean shipments to China. "Soybean exports to other regions have strengthened in response to competitively low U.S. prices. In particular, import markets such as the EU, Thailand, Vietnam, Taiwan, Pakistan, and Egypt have all been more active purchasers of U.S. soybeans. 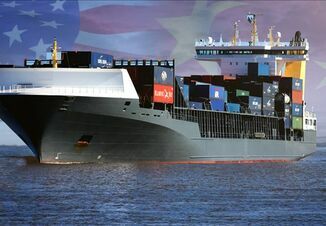 In addition, Financial Times writer Tom Hancock reported Wednesday that, “After losing a race to reach China before Beijing imposed an added 25 per cent tariff on a swath of US goods last month, the Peak Pegasus sat anchored in the Pacific for weeks while its 70,000 tonnes of soyabeans on board awaited a buyer. The saga of the Peak Pegasus underlines how China has little choice but to buy the oilseed from the US to feed to its vast pig- and chicken-raising industries. But with Beijing keen to punish Washington, the question for American farmers is how quickly China can reduce its dependence on US soyabeans. Meanwhile, Wall Street Journal writers Chao Deng and Bob Davis reported Thursday that, “China and the U.S. reached a modest breakthrough in their standoff over trade, saying they would hold lower-level talks later this month on the spiraling dispute. Editor’s Note: Keith Good is the social media manager for the farmdoc project at the University of Illinois. He is well known in agricultural circles for the daily FarmPolicy.com News Summary. This article first appeared online at the University of Illinois’ Farm Policy News.